Are bright Colours in fashion? Now, this is something I originally started to put together to fit for the Revilgaz’s Cutlass I got some time ago, since I really want to have a matching and good-looking Set to wear together with it. In the end it turned out that there was an even better choice for a weapon though, so I replaced it and failed in my original intention – but am still pretty happy with the results. Who doesn’t like nice surprises? But anyway, this is my Noble Duelist Set! 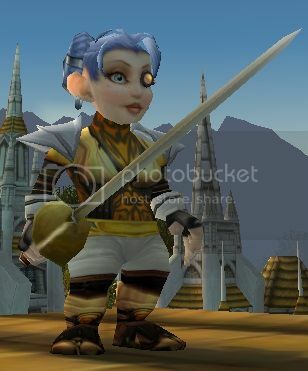 I know, gnomes aren’t exactly the stereotypes of either a noble or a duelist, but this is what I got and it looks pretty good on her. The theme probably fits better on a human for roleplay uses, but since I just want to look good sometimes and don’t necessarily pick my outfits role appropriate only (sitting around in the Auction House or Mailbox area doesn’t exactly fit in with good roleplaying behaviour anyway, so why not look fabulous while doing so, at least?). Goldweave Tunic: Same model as the Elegant Tunic that’s for a lot of money on the Auction House regularly, but can be obtained by doing an easy Quest on the Hellfire Peninsula (available for Alliance and Horde). One of my favourites in the cloth chest armor department, together with the differently coloured look-alikes! Yellow Martial Shirt: I think I might be starting to repeat myself a lot here.. the Martial Shirts are simply awesome for adding another layer in a fitting colour and making everything look more complete. Gnomish Casting Boots: These pretty unique boots match perfectly to the chest, but that’s no wonder since they’re apparently a part of the recoloured mageweave regalia, so not really a surprise here. Another Quest reward, this time in the Blade’s Edge Mountains. Sutarn’s Ring: I’m not all too happy with this belt because the colour doesn’t match 100%, but so far I couldn’t find anything that fits perfectly, so since I had this one already I’m keeping it like this. Can be replaced with something like the Astralaan Belt for example, or with anything that fits the yellow tones better if found. Otherwise, the best bet to find it is probably once again the Auction House – at least that’s where I got it from. Astralaan Gloves & Pants: Same as for the Battlemage Outfit before, the Astralaan Stuff is just great for completing Sets because black and white are easy to match to pretty much anything and look good on their own. 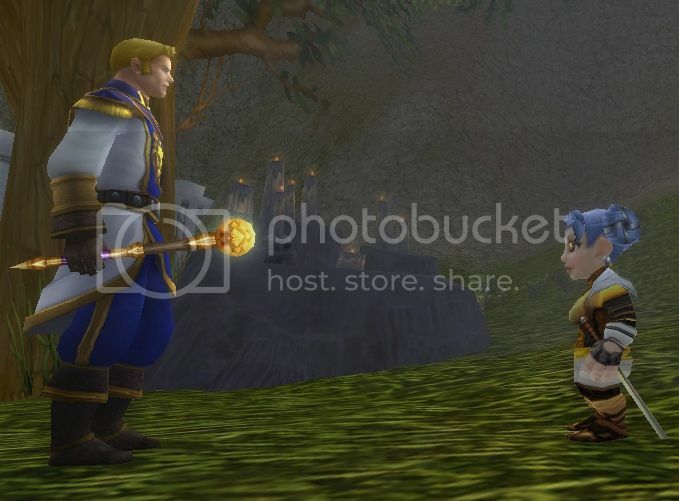 Aurora Mantle: I believe the Aurora items are fairly common because they look good and match a lot of different stuff, so it shouldn’t be too hard to get some of it through the AH for anyone who is willing to spill some gold, or even get some drop luck while levelling a new character up. That’s where I get a surprising amount of good looking low-level items! And somebody who doesn’t need them should be able to sell them for a good amount of money.. Anyway, these work well with he white of the Astralaan items and isn’t as huge and overwhelming as most shoulder armor looks on gnomes, eventually there are some other great fitting ones for other races. Jeweler’s Amber Monocle: I found these monocles in the AH and fell in love with them, so of course there was no way around buying one! Especially awesome because the colour fits greatly, once again. 😀 The only big downside of it is that it’s not working for transmog, but there are good alternatives, like the Chief Architects Monocle or Cassandra’s Grace. Electrocutioner Leg: The colour of this Sword matches really well with the overall look, that’s why I went to Gnomeregan a few times and dumped Revilgaz’s Cutlass in favour of it in the end. Both still work pretty well in general though. The leg is probably easier to get anyway, because there’s just a little drop luck needed, while the other one only is available for finishing various quests. This entry was posted on Friday, September 6th, 2013 at 02:59	and tagged with auction house, Transmogrification, world of warcraft, WoW and posted in Armor Sets, World of Warcraft. You can follow any responses to this entry through the RSS 2.0 feed.